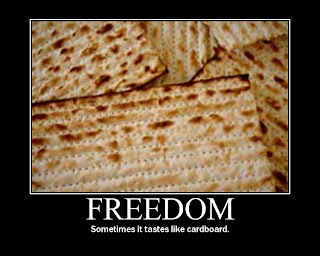 Because even though it is not Passover until tomorrow (Saturday) night, you still need to eat on Passover dishes and eat Passover food, since the cleaning has to be done before Shabbat. (If you're following the tradition, that is -- as we do in my house.) 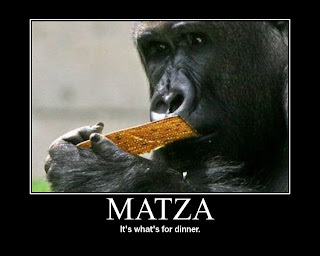 In fact, strictly speaking, you can't even eat Matza tonight, since you're not supposed to eat it until the first Seder. Unlike the seder, that's unique. Only one night a year -- not even: only one night in those years that Passover starts on Saturday night. * You can eat egg Matza, apparently, which is one way to do lechem mishna. So that sentence is an exaggeration. Via Andrew Sullivan (and from there Arts Journal) comes a series of links to a pair of quite fascinating projects: attempts (no relation) to make the most -- and least -- appealing of all possible art, based on polls of what people say they want. These come in two varieties (that I've seen so far, anyway): music and art. -- But, of course (and this is one of the points, I presume) putting all these things together make not only a truly bizarre piece of music, but also change the nature of the undesired elements in lots of ways -- including removing the characteristics that make them undesirable. Holiday songs are one thing; snatches of chorus about labor day (that was the part that had me literally laughing outloud) and Halloween in an otherwise bizarre mix of strange styles of music are something else again. 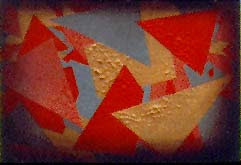 But again: the assemblage is not the sum of its separable parts. The fact that I liked it doesn't make me one of a select 200 world-wide; it (as, I presume, intended) makes the point that this music is, in fact, better than it polls. On the other hand, I could barely get through Soldier's "The Most Wanted Song" (mp3 link); it was too irritating and insipid. Now that's crappy music. Even though it was far, far briefer than its supposedly undesirable cousin. I recommend the Unwanted Song. Really. Soldier's music seems to have been inspired by a visual arts project by the artistic team Vitaly Komar and Alex Melamid, who did a series of polls to determine the most wanted and least wanted elements in painting. You can see all the various most wanted and least wanted paintings here; they did different ones for a whole series of countries, plus a pair for "the Web". Here are the ones for the U.S. 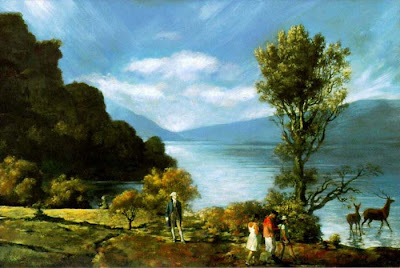 The U.S. painting, as this blog post summarizes, "has it all: an autumnal landscape with wild animals, a family enjoying the outdoors, the color blue, and George Washington." (I think the divergent sizes are part of the polling, incidentally). Again, I prefer the least wanted -- although the most wanted painting isn't nearly as bad as the most wanted music, while the least-wanted panting isn't nearly as good as the least-wanted music; funny, that. Does this say something about the artists, or the mediums, or is it just a personal reaction on my part? I'm not sure. But as before, smashing high-polling elements together robs them of what people like about them, but redeems poorly-polled elements through juxtaposition. Now, who's going to do the narrative versions? Any takers? ...This, of course, has been a post about politics: the most wanted/least wanted experiment has been done far, far, far more often with politicians than with art or music; but with nearly identical results. A lesson for those who would heed it. In each case, click on the image for a larger version -- really, do: it's only worthwhile if you can see it. 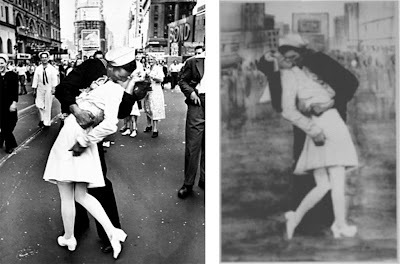 Photograph of a kiss in Times Square on V-J day (August 14, 1945) by Alfred Eisenstaedt, and memory rendering of it by Vik Muniz. Interestingly, there seem to be a lot of claimants to be the sailor portrayed in this photograph. Photograph of astronaut Buzz Aldrin by Neil Armstrong, 1969, and memory rendering of it by Vik Muniz. Photograph, "The Unknown Rebel", taken by AP photographer Jeff Widener in Tiananmen Square in 1989, and memory rendering of it by Vik Muniz. 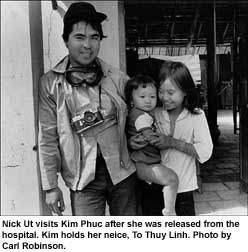 Photograph by Nick Ut (aka Huynh Cong Ut), taken June 8, 1972, showing Phan Thị Kim Phúc running after her clothes had been burned off by a South Vietnam/US Napalm attack. In 1996, she gave a speech at the United States Vietnam Veterans Memorial on Veterans Day... One Reverend John Plummer, a U.S. Vietnam War Veteran, had seen the photo and believed that he had a part in co-ordinating the raid with the South Vietnamese air force. He met Phúc briefly and she publicly forgave him. What can I say? I'm a sap: I love happy endings.